Mutation rates may vary along the length of a protein, thus choosing a single multiple sequence alignment parameter choice may not be appropriate. 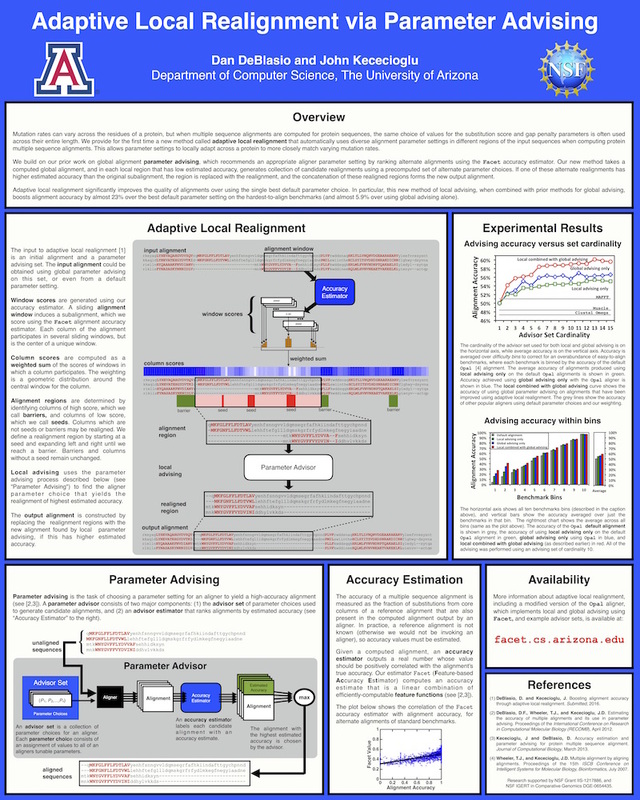 To overcome this we have developed a method called Adaptive Local Realignment which uses parameter advising to choose alternate alignment parameters choices as the underlying mutation rate changes. To accomplish this we first use Facet to compute column scores for an alignment (by estimating accuracy in sliding windows across the alignment) and identifying columns that are very low quality (seeds) and very high quality (barriers). We can then extend the seeds to the left and right until they reach a barrier to create realignment regions. For these regions we use parameter advising to select a parameter choice that generates a more accurate sub-alignment. Currently adaptive local realignment is integrated into the development version of the Opal aligner which is available on GutHub. A related publication that explains the details, as well as a conference poster will be available soon. Proceedings of the 21st Conference on Research in Computational Molecular Biology (RECOMB) 2017, Springer-Verlag Lecture Notes in Computer Science 10229, 1-17, 2017. Slides from my talk is ISMB 2016 can be found here. Adaptive local realignment is included in the newest version of the Opal aligner. The Opal distribution includes the Opal and Facet software as a .jar file as well as a driver and the scripts needed to predict secondary structure. Advisor sets can be downloaded below. Note this application requires a working copy of PSIPRED as well as BLAST. PSIPRED v3.2 can be downloaded here: (link). Facet is free for noncommercial use, and comes with neither warranty nor guarantee. Facet cannot be redistributed in any form without consent of the authors. If you wish to use Facet for commercial purpose, you must first obtain the permission from all authors. All noteworthy uses of Facet should cite the related paper.